Showcase several lightweight ornaments using these Audubon Clear Window Glass Hangers. This set of 6, plastic hangers adds display area to a few different windows, and their clear design keeps them inconspicuous. 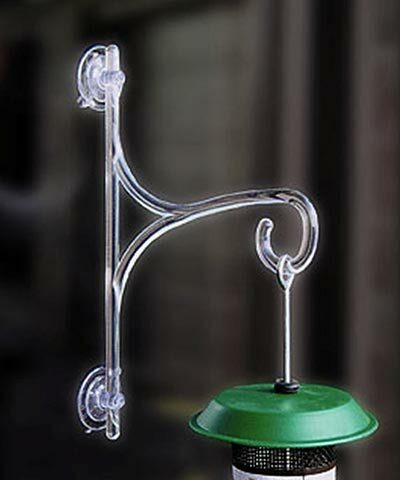 Two generous suction cups on each bracket affix to a clean window easily, and a single arm extends outward and culminates in a curl to hold your small ornament or feeder. Orient the curl upward and use the units on a large window to support a string of lights, or place the curl facing downward to hold small bird feeders or other accents on windows throughout your home. Add hanging spots to few windows with these Clear Window Glass Hangers. Note: This case pack includes 6 of the Audubon Window Glass Hangers, Clear, 11".